The point of data governance compliance isn't to establish who owns data. It's to optimize the value your data can deliver to your business. If your organization isn't making end-to-end data governance and stewardship a priority, it's letting opportunities to establish competitive advantage slip by. 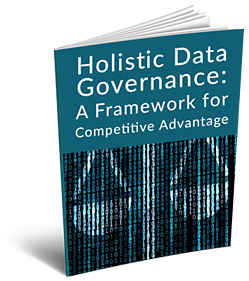 This white paper explains the tools you need to establish data governance as a strategic business priority. Download "Holistic Data Governance: A Framework for Competitive Advantage” today and learn how intelligent enterprise data governance and compliance can deliver better business outcomes.